I’ve done a lot of work over the years building, buying and testing to destruction strobe lights. 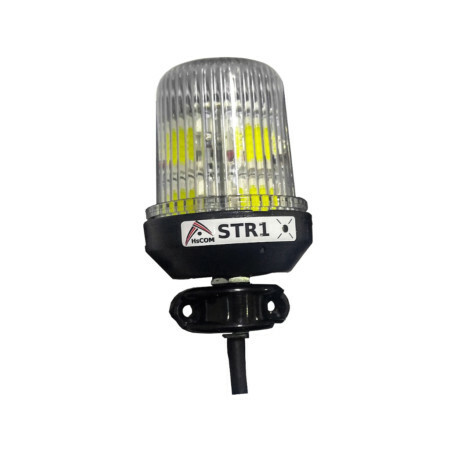 I’ve finally found a Strobe Light that is BRIGHT, durable, lightweight and FAR103 compliant– actually, it far exceeds the FAR 103 requirements. I hope to offer a complete Strobe/battery/switch solution soon, but for now I’m just selling the Strobe unit. Batteries and Switch not included, but see instructions below for recommendations. CAUTION: Don’t look at the strobe when it’s blinking! It will hurt your eyes. Using a piece of wire or string, measure the distance between where you would like to place the strobe, and where you would like to place the on/off switch and battery. Decide whether you need a 1.25m or 1.65m cable, and specify which one you need when ordering. The HsCOM STR1 is designed for a 12-volt electrical system, but works between 10 and 14 volts. I tested the STR1 with a 3-cell, 1300mah 11.1v Lithium Polymer (LiPo) battery, and a lead acid 12v automotive battery. Both batteries ran the strobe light with similar brightness. The strobe light ran for 2 hours and 5 minutes with the small 1300mah LiPo battery. 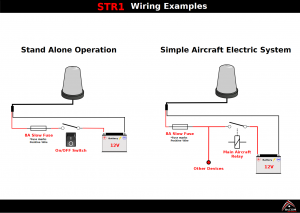 The Strobe automatically turns off when the battery voltage reaches 10v, which is well above the under-voltage limit of 9 volts for a 3-cell, 11.1v LiPo battery. This means you should get a long lifetime out of a 3-cell LiPo battery. I would recommend against using a 4-cell or higher LiPo battery, as its maximum charged voltage would exceed the recommended upper voltage limit for the strobe. Consider that Lithium Polymer (LiPo) batteries have been known to burn furiously if mishandled, stored improperly, or damaged. Some LiPo batteries have protection circuits built into the battery package to prevent common dangerous conditions. If you decide to use LiPo, be sure to buy a battery with a built-in protection circuit, and ALWAYS use the recommended LiPo cell-balancing charging station. Even a well-protected LiPo battery can rupture in a severe crash. A safer alternative may be Lithium Iron Phosphate (LiFePO4), or Nickel-Metal Hydrate (NiMH). If you’re on a Trike and weight doesn’t matter, consider a tried-and-true Lead-Acid battery. These alternative technologies don’t match the energy density of LiPos, but how long are you going to be running that strobe light, anyway? Be sure to use the recommend charging station for whichever battery chemistry you choose. You can use just about any switch you like, but I recommend using one that is rated for 8 amps or higher. Virtually any switch found at an automotive supply store will do the trick; They’re generally durable and vibration resistant. If you are placing the switch so that you can reach it while flying, make sure that you can’t accidentally reach past the switch and touch the hot engine or propeller. As with anything that you attach to your paramotor, secure the switch so that no part (including the wires) can touch the propeller or hot engine. find a location on your paramotor frame to securely and visibly mount the metal clamp. Verify that if the clamp gets loose and swivels or slides, the strobe light cannot hit the propeller. If your attachment location is too skinny for the clamp, you can use a section of fuel line or other soft plastic tubing to bulk up the attachment point. Consider that lines could get caught around the the strobe, so don’t place the strobe sticking out the side of your cage where you could easily snag it during a launch. The very top of the cage is a popular location, though you still might get lines around the strobe if you botch a launch. Mount the strobe in an upright position. This gives maximum visibility to aircraft above and around you, and prevents water from entering the strobe enclosure through the vent holes. Run the cable down a solid piece of your motor to a hand-accessible location, and verify that you have enough cable length to reach where you want to put the power switch. Use zip-ties every 6 inches along the cable to secure it to the motor frame. If you put the on/off switch near the hot exhaust or behind you toward the propeller, consider adding extra safety netting or guards to prevent your hand from going too far back when reaching for the strobe switch. 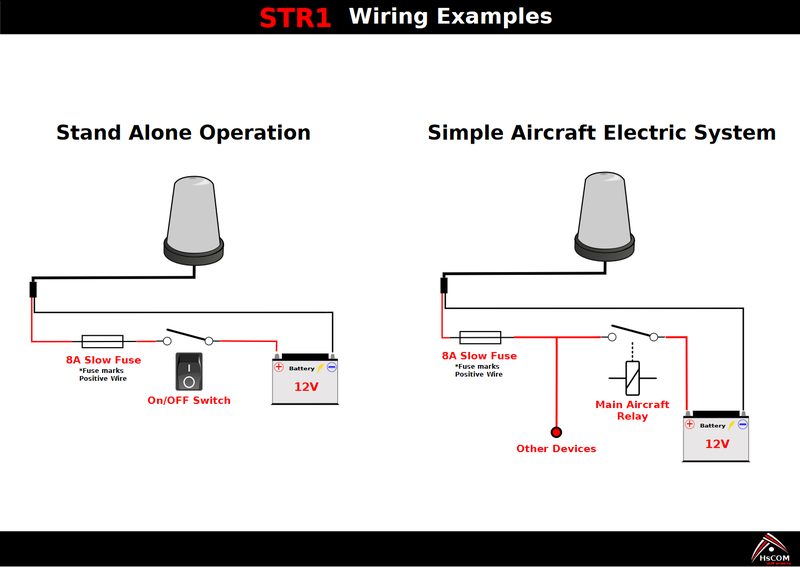 Attach the positive wire of the strobe (red, fused) to the on/off switch. Attach the ground wire of the strobe (white) to the negative side of the battery. create a wire (10 Amp rated at least) between the positive side of the battery and the switch. If using a Lithium-Polymer battery, either enclose the battery in a fireproof container with vent holes, or attach it far away from your fuel tank. Make sure nothing hard and sharp contacts the battery in a way that would cause motor vibration to rub a hole in the battery.